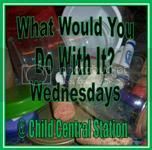 Welcome to this week's edition of What Would You Do With It? Wednesday. This week we are looking at liquid laundry detergent bottles! We have been collecting these bottles for a very long time and have accumulated all sorts of different shapes and colors. There are 2 major projects we do with these bottles every year. First, we make them into butterflies! Our outdoor art gallery/rock garden always gets a few butterflies for our walking neighbors and community members to enjoy! I have an earlier post listed here with all of the details. Of course, they can be decorated in a variety of different ways. The second project that requires some detergent bottles is our annual totem pole. The totem is primarily made from metal coffee cans. However, we use laundry detergent bottles for the accents - like making elephant ears or eagles wings. The first one is a bird feeder that I found here. I'm still looking to find some great inspiration on how to use Crystal Light Containers. 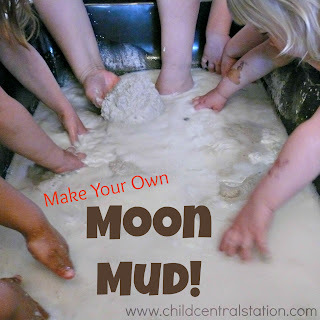 If you have a great idea, please pop on over to last week's challenge and link up! Abbie from over at Greening Sam & Avery came up with this very nifty idea on how to use the containers to make a rain gauge! On to this week's link up! Plastic Laundry Detergent Containers- It's your turn! Do you have a great idea or post that you can share using Laundry Detergent Containers? If so, please join in linking up! Next week, I will feature my favorite link up and I'll be posting about Pizza Boxes! Hopefully, I'll be on time! LOVE that bird feeder. We will have to give that a try the next time we empty one of those containers. I don't have those on hand right now, we have been using homemade laundry soap for a while now. But I have one bottle of detergent about half gone right now. Have to use that bit so we can try out that bird feeder. Does that seem backward and silly? HA! I don't have a blog so this is just for fun. Cut the top off the bottle, about 2 or three inches below the handle. Save the bottom for another use. (They make good plant starters.) Tie a piece of string thru and around a good size wooden bead. Punch a hole about an inch down from the cut opposite the handle and tie the other end of the string through the hole. You'll have to judge the length of the string by the age of the kids and how difficult you want it to be. Put duct tape over the cut edge. You have now made one of those games were you try and flip and catch the ball. It would be some much easier to just draw a picture! Amy, I really like your totem pole, and butterflies, which I intend to use once spring and summer rolls around. Many thanks for the creative ideas, and photos! Aaaah cute! I didn't see the butterfly straight away, but then came back for another look and really like the idea! And I LOVE the totem pole... they look great! Looove the totem pole Amy. Thanks! This totem is actually the one from a couple of years ago. We make a new one every spring, as we need to put it away for the winter. (It just wouldn't hold up in the snow). Each spring we reuse parts that have survived storage. (Sometimes with a fresh coat of paint) The children help fix it up and add/remove parts that they determine need to change. Here's to *hoping* that our spring is right around the corner and we can get busy on this year's version! @Abbie that is a little backwards, but sometimes that's just the way it goes! We end up with so many different colors and sizes because I have them on my wish list. Parents and friends save them for us. Not all of the areas around here have a recycling program, so they are very happy to bring items to us to reuse! @jwg - If you ever want to guest post an idea that you have photos for, let me know! I get the just of what you are saying, we might have to try it out and post it up for other folks! Could you possibly post instructions for assembling the coffee can totem poles? I plan to start saving materials, but wonder how you build it, etc? This is something I want to do come summer, it is just such a great idea, and our outdoor play space needs some creative sprucing up. Depending on your weather, you might opt to make them differently. The ones for the fall are much shorter because of the higher winds we have in the fall :). I hope this helps. Just wanted to thank you Amy for the instructions to your totem poles. Well, I just couldn't use the store bought stuff so we tried it out with a big juice container instead. We drink way too much juice in this house so I have plenty of those! Linked up to you of course. Thanks for the great idea.